Hundreds of Charlotte-area teachers gathered in uptown Wednesday to rally while thousands of teachers across the state protested in Raleigh. Dwayne Simmons had one thing on his mind as he stood in the blistering heat of First Ward Park: money. Teaching is his passion, he said, but it can be stressful, too, at times, to live paycheck to paycheck. While thousands of teachers and educators convened at the state Legislature in Raleigh on Wednesday, Simmons joined educators in the Charlotte region who stood in solidarity by having a demonstration of their own. They were all raising awareness for higher pay for teachers and more funding for education. 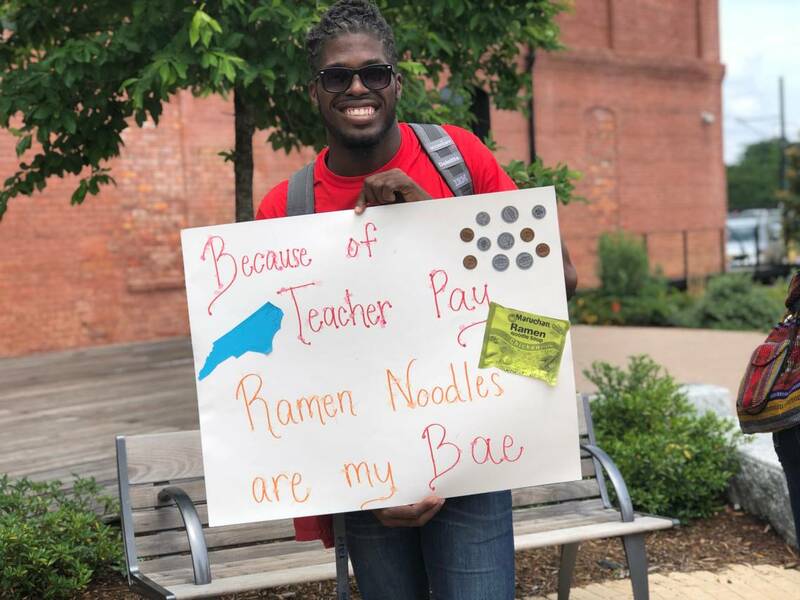 Dwayne Simmons, a teacher at Ashley Park, went to Charlotte’s local rally for teachers, advocating for an increase and teacher salaries and funding for education. Like their counterparts in Raleigh, the educators talked about a clear a path toward achieving their goals. “We must turn out the vote this fall, and the future of North Carolina schools hinges on this midterm elections,” Elena Brown-Richardson, a teacher at Carmel Middle School, told the crowd. Brown-Richardson helped organize the local gathering when she realized that, despite the desire from many local teachers to travel to the main event in Raleigh, not everyone was capable of attending. The gathering in uptown was a way for those teachers to still have their voices heard, she said. In a speech, she described the daily stresses of a life in education. The crowd of teachers cheered in agreement, as she spoke of poor learning conditions for students and work for teachers that extends beyond their normal hours. She often works 60-hour weeks when planning and grading is factored in, and doesn’t feel the compensation reflects that, she said. She hoped Wednesday’s events would lead to meaningful improvements that would benefit students. “One of the most important lessons we will teach our students all year might be today, ironically, when we are out of school,” she said. Charlotte-Mecklenburg Schools was one of at least 42 school districts across the state to close for the day in light of the protests. An estimated 19,000 people attended the larger demonstration in Raleigh, according to the Downtown Raleigh Alliance. It’s the largest organized political action by teachers in the state’s history. The protest comes after recent teacher strikes and walkouts in states like Kentucky, West Virginia and Oklahoma. Sherrie Dame, who helps tutor small groups of students at a school in Mooresville, doesn’t have her pay funded through the state like other teachers. Instead, she said she was mostly at the rally to support educators like the ones who teach her children. Dame brought her kids to the protest to show them how teachers are raising an issue on their behalf. Posted in Accountability, Advocacy, Education Budget, Educators Protest, Every Student Succeeds Act, No Child Left Behind Act, School Closings, Students and Parents Protest, Teacher Shortage and tagged "Standing Strong for Public Education", #iBelieve, Accountability, Accountability System, Advocacy, Department of Education, Diversity, Education Funding, English Language Learners, Equity, Every Student Succeeds Act (ESSA), Failing Schools, Federal Education Policy, High-Needs Students, NEAExecutiveCommittee, Pension, Pensions, Public Education, Students, Testing and Accountability. Bookmark the permalink. Betsy DeVos knows little about public education. And she doesn’t want to learn.